From NOW until April 30th, 2018 get back up to $250 dollars on ST Coilovers! Rebate + FREE SHIPPING + Bonus ECS GiftCards! The ST rebate is almost gone! Don't forget during this limited time rebate offer you also get ECS Bonus Gift Cards! First day of the last month to take advantage of the ST Rebate is coming soon! Last edited by ECS Tuning-Audi; 03-30-2018 at 09:12 AM. Much low for much less! 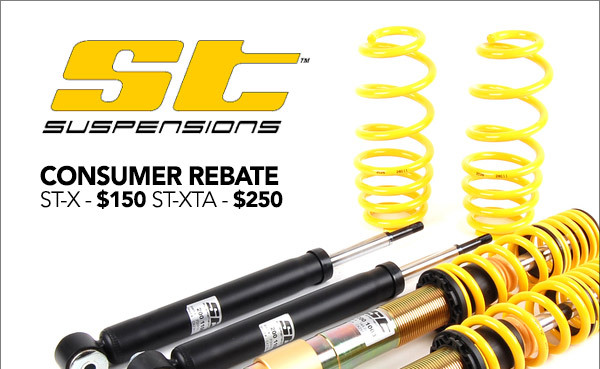 Quick Reply: REBATE ST X and XTA Coilover up to $250 back! !